After receiving the donation of 388-acre Eden Hall Farm north of Pittsburgh, Chatham University conceived an audacious goal to create the world’s first net-positive campus. The first phase of campus development is now complete, and was recently honored by the American Institute of Architects with an AIA Committee on the Environment (COTE) 2017 Top Ten Award. 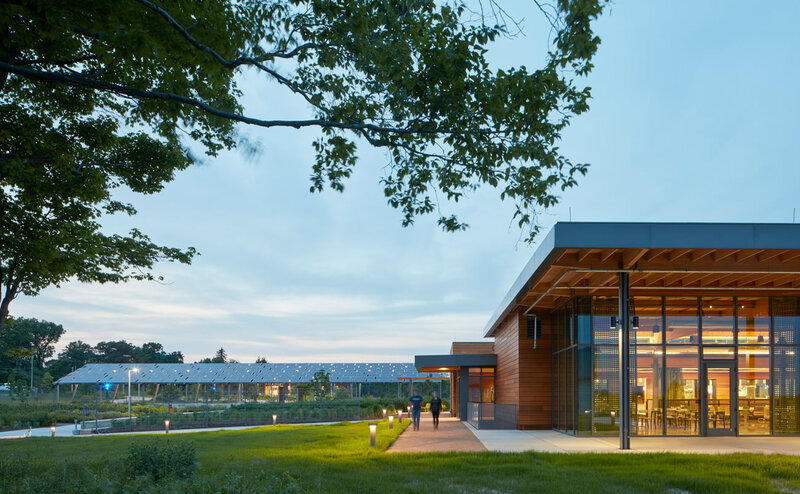 Home of the Falk School of Sustainability, Chatham’s Eden Hall Campus is designed to generate more energy than it uses, is a water resource, produces food, recycles nutrients, and supports habitat and healthy soils while developing the next generation of environmental stewards. How is this possible? We’re excited to share insights into the project’s integrated design approach and innovative results in the following key areas. 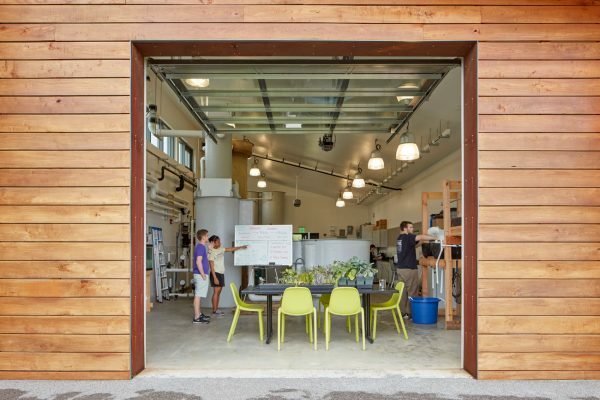 Chatham University Eden Hall Campus has been designed and built to demonstrate and test sustainable systems from the ground up, featuring full-cycle water reuse systems, net positive energy production, and zero waste operations in an immersive living and learning environment. This project takes on the challenge of sustainable living and the big idea of the “New Farm” as productive landscapes adjacent to urban centers are increasingly necessary to achieve a sustainable region. The first phase of development for this new satellite campus is 31.5 acres within a 388-acre site that will ultimately house 1,200 residential students. The campus provides an important opportunity to demonstrate sustainable land use practices in the peri-urban setting—as this urban to rural interface area is the fastest growing portion of Greater Pittsburgh and also the area with the greatest water quality challenges in the state. The campus invites research as well as daily mindful living as it engages and raises awareness of how individuals and communities impact resources and living systems. The first phase of construction had its initial occupancy in 2015, including a first dormitory, field lab and hoop house, café, dining commons with integrated classrooms, outdoor gathering spaces and supporting infrastructure. Additional facilities have been designed to define a core campus supporting 250 residential students. The buildings, landscapes and infrastructure have been developed as an active research environment including building technology, renewable energy systems, sustainable agriculture and food systems, aquaculture, water treatment and nutrient recovery, watershed protection, soils, wildlife and habitat. Design integration is demonstrated, tested and measured in the linked site and building infrastructures, and exploration of strategies to build community and support healthy living is ongoing as well. As a place dedicated to teaching sustainability, Eden Hall Campus is designed to reveal natural systems. Buildings are sited so that pedestrian circulation follows the flow line of the site topography; primary campus circulation traces the low point of the valley, orienting to the watershed and framing views beyond. Raingardens are interspersed with gathering places, illustrating patch ecology and leading to an amphitheater that doubles as a stormwater basin with raingarden plantings surrounding an elevated stage. Patch dynamics are also abstracted into an educational garden called the Mosaic Field, where diverse functional landscapes are highlighted including constructed wetlands for wastewater treatment, rooftop rainwater collection, raingardens for stormwater management, native plantings and herbs for the kitchen. It is a place where old meets new, highlighting and contrasting native plantings with agricultural patterns. The design also focuses on management of invasive plants and animals, and the provision of stream buffers, wildlife habitat crossings and substantial landscape buffers along the campus perimeter, with 40% of the land in a permanent conservation easement. Partnerships with non-governmental organizations focused on landscape ecology resulted in fruit tree planting of heritage species, on-site annual bird count stations and a future natural play area for visiting school groups and the surrounding neighborhood. Pennsylvania hardwood forests are the most species rich ecosystem in the country. The site design includes more than 1,000 new trees and 4,000 new shrubs with more than 59 tree species, 55 shrub species and a complex meadow system instead of the monoculture of turf grass. Eden Hall Campus sits at the headwaters of the Ohio and Mississippi River watersheds, with water quality challenges from historic pine plantations, agriculture and invasive plants that have contributed to soil erosion and sedimentation of creeks. The campus sits within Richland County, which also has water quality challenges as municipal sewer overflows contaminate regional water quality. This project offers the region a new model with an integrated approach to water resources, management of nutrients and mitigation of impervious surface. A constructed wetland wastewater treatment system provides superior wastewater treatment onsite using a plant-based biological system for all buildings except for Orchard Hall, which is connected to the municipal sanitary sewer until a future phase. Rainwater is collected from rooftops for irrigation and 24 raingardens on site manage surface stormwater, providing habitat for birds and pollinators. Use of potable water is reduced as captured rainwater and treated effluent from onsite water treatment is used for irrigation and toilet flushing campus wide. The Field Lab offers diverse research opportunities with a Treated Sanitary Effluent (TSE) Room for final filtration and polishing, water quality monitoring equipment, and an aquaculture lab for yellow perch and other coldwater species. The aquaculture systems engage synergies with the nearby Hoop House for year round growing of fruits and vegetables, offering complementary environments to explore the reuse and recycling of nutrients, effectively transforming waste into resources. Five types of water—city potable water, harvested rainwater, greywater, TSE, and aquaculture effluent—are used for water quality and agricultural research. All stormwater leaving the site is treated to remove a minimum of 85% of all total suspended solids (TSS). Stormwater that is infiltrated into the ground has 100% removal of TSS. The wastewater systems produce high-quality effluent that is filtered, disinfected and low in nutrients. This water is reused when possible for toilet flushing, and any excess is slowly recharged to the groundwater through the subsurface land application system which provides one additional level of filtration through the biologically active soils. BOD and TSS are anticipated to be less than 10 mg/L. While wastewater treatment systems typically work to eliminate excess nutrients, low level nutrients in wastewater can offer beneficial nutrient cycling for agriculture. The Eden Hall Campus is designed as a grid-connected, net-energy positive campus, with buildings designed to meet highly efficient energy targets of 20 EUI (Energy Use Intensity, measured in thousands of btu’s per square foot per year) for building loads exclusive of food prep and aquaculture systems. Renewables include photovoltaic (PV) rooftops and canopies, solar hot water and geo-exchange. A small 10 kW co-generation plant in the dining commons produces electricity and hot water using natural gas with bio-fuel equivalency, part of a long term waste to energy strategy. An energy loop links buildings, enhancing the efficiency as low temperature geo-exchange water acts as a thermal sink and distributes excess heat to other buildings. When the PV canopy at the north parking lot is complete the net positive goal will be met. 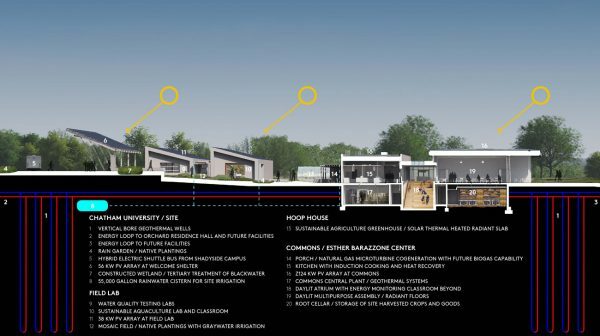 As the hub for cooking and dining on campus, the Barazzone Center presents an energy design challenge, as it has the highest EUI of any building on campus. Detailed energy models and a collaborative effort with kitchen operators to adapt the menu, food service and systems—including an innovative kitchen design using electric induction cooking, high efficiency refrigeration and a root cellar with a focus on fresh food—yielded impressive savings, with predicted energy use reductions of 65%. The buildings have also been designed to promote health and wellness—for example, the net zero energy Orchard Hall has operable windows in all rooms, excellent daylight and views, individual climate controls on a room-by-room basis and 100% fresh air with no re-circulating air between rooms. Wellness is also supported with informal gathering spaces on each floor, a gym on the upper level and conveniently located daylit stairways to encourage walking. Super-insulation and deep overhangs on south facing windows boost building efficiency together with an innovative radiant heating and cooling system embedded in the gypsum board ceiling, quietly heating and cooling without any separate radiator or fan. Mechanical systems utilized dedicated outside air systems (i.e. non-recirculating air systems) to minimize transfer of germs. Eden Hall’s visionary goals demanded a process where the design team participated as active partners in co-creating a new education model that incorporates buildings, site and infrastructure as integral elements in the educational experience. At the same time, the university is working to shift its culture to one that engages students as active learners, initiating projects and research that reflect their personal interests. In this context the building of community and the development of governance structures are primary opportunities and challenges. Who defines the research? Who owns the data? And what is the ongoing role for the design team? Co-presenting this project with university partners at numerous conferences including Greenbuild, Living Future, SCUP and ISCN has enabled many opportunities to assess how effectively the project has met it goals and what has been learned; shared publications have been another tool. Post-occupancy evaluation has been initiated to gather feedback systematically on technical issues including thermal comfort and daylighting, as well as insight into experience of living on campus. Results show that Chatham is not just attracting a unique cohort of students, but it is changing their lives, building awareness of sustainability strategies and cultivating healthy habits they will take into the future. The design team developed a detailed post-occupancy survey that was competed on-line by 56 people, including 33 student and 26 faculty and staff. Given that the survey was distributed to 137 people, this represents a response rate of 40%. The survey collected feedback on each of the four primary buildings, landscape spaces, travel mode to campus and the campus as a whole. 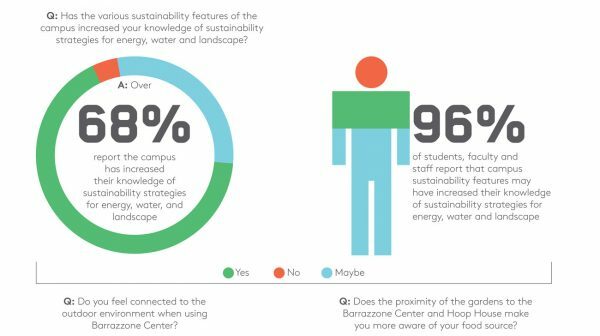 It also included questions asking how the experience of living and learning on campus has impacted their understanding of sustainable systems and strategies for healthy living. The current plan is to repeat the survey each year as the campus is developed and the population using the campus grows. 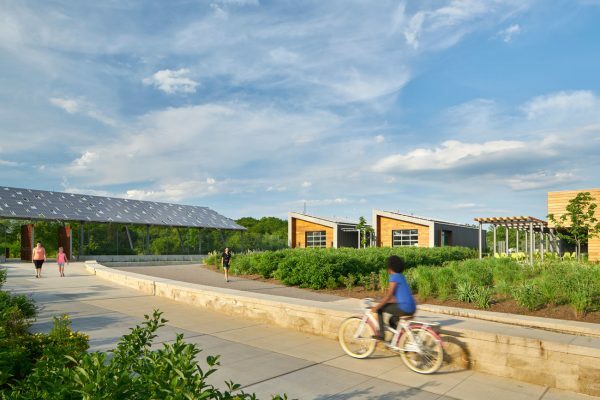 Visit the AIA COTE showcase of 2017 Top Ten Projects for expanded information about sustainable strategies and performance at Chatham University Eden Hall Campus, and links to additional honored projects.